Fashion Maven... Mommy: Lets Go Crazy! I'm totally loving plums and wines this Fall season! I recently purchased this gorgeous Deborah Lippmann polish in Lets Go Crazy at Nordstrom and have fallen deeply in love with this rich hue! It's a deep plum purple filled with various size sparkles giving it that little extra something special. 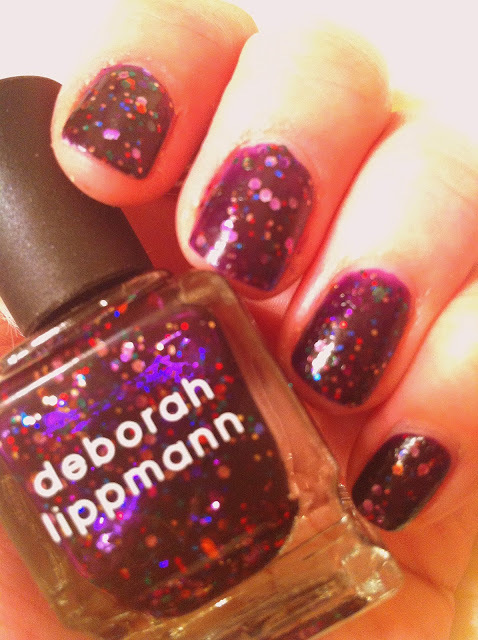 Deborah Lippmann has an amazing ability to make the most amazing sparkle polishes without feeling too teeny-bopperish! They're just the right amount of fun! And i love me some fun! So sparkly, really cute :). i love it, so apt for fall,i want to buy it too,it looks so good on u ! aww i love it!! so pretty!! i love it!!! now i'm your follower! !